Many cities in Iowa have retained the original brick street surfaces in downtown areas and in older residential areas as the base for modern driving surfaces. The original brick surfaces were not built to handle current and future traffic loadings. In recent years, these surfaces have tended to shift and become uneven, creating problems with safety. 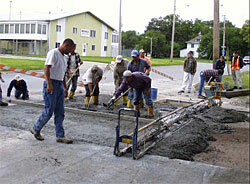 Asphaltic concrete overlays have been the typical rehabilitation technique in these situations. This has proven to be a successful rehabilitation technique in some cases; in other cases, the combination of movement of the brick and flexibility of the asphalt has proven to accentuate the original problems. Most of the existing literature on rehabilitation of brick streets shows the use of asphaltic concrete. Other rehabilitation methods include reconstruction of the brick surface and strengthening of the surface by placing asphaltic concrete or portland cement concrete, along with sand, underneath the brick layers. To date, little if anything has been done in the area of using portland cement concrete as an overlay of the brick surfaces. This final report documents the planning, construction, and performance of unbonded ultrathin whitetopping rehabilitation of a brick street in Oskaloosa, Iowa, in 2001. It also reports on a similar project in Des Moines that was constructed two years later in 2003.